Noriyuki Takai, a gynecologic cancer researcher at Oita University in Japan, has lost another five papers. With a new total of 13, that means he’s now on our leaderboard. 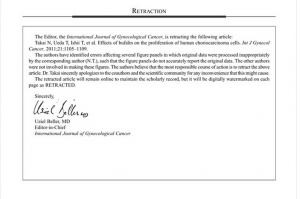 Three of the retractions are from the journal Tumor Biology, one is from the International Journal of Gynecological Cancer, and one from Anticancer Research. Takai is the first author on all 5 papers. The corresponding author, Dr. Takai, sincerely apologizes to the co-authors and the scientific community for any inconvenience that this might cause. 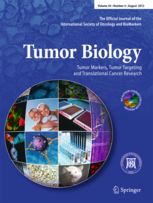 The article entitled “Anticancer activity of MS-275, a novel histone deacetylase inhibitor, against human endometrial cancer cells” by N. Takai, T. Ueda, M. Nishida, K. Nasu and H. Narahara, published in Anticancer Research 26: 2A (March-April) pp. 939-945, 2006, is retracted by the Authors. A commenter on PubPeer has pointed out a few issues with the figures in the paper. The paper was published in 2006, and has 15 citations, according to Thomson Scientific’s Web of Knowledge. Click on the link or image for a more readable version. Or just keep reading to the next notes. They are all very similar. The paper was originally published in 2011, and has 9 citations. 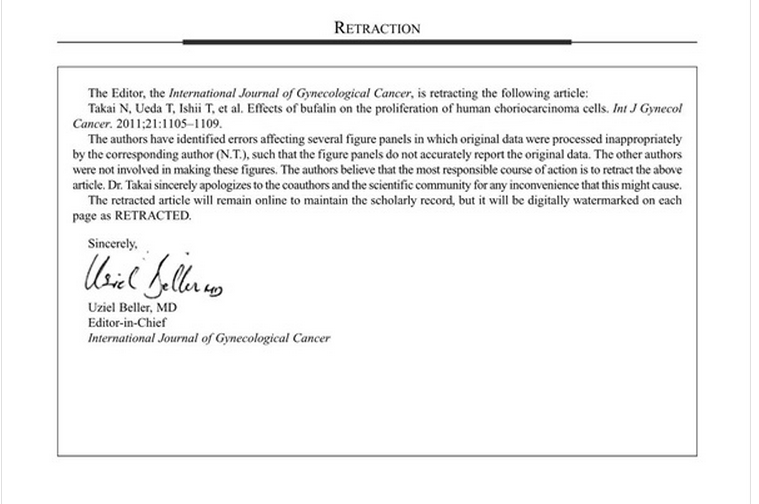 The rest of Takai’s new retractions are for papers in Tumor Biology. This article has been retracted on request by the corresponding author. The authors have identified errors affecting several figure panels in which original data were processed inappropriately such that the panels in Fig. 4: “Expression of the cell cycle- and apoptosis-related proteins treated with KN-93 in choriocarcinoma cells measured by Western blot analysis. Choriocarcinoma cells were treated with KN-93, and cell lysates were harvested after 48 h. Western blot analysis was performed with a series of antibodies (cyclin A, cyclin D1, Bcl-2, and cleaved caspase-3). Control cells were treated with vehicle alone. The amount of protein was normalized by comparison to levels of GAPDH” do not accurately report the original data. The other authors were not involved in making these figures. The corresponding author, Dr. Takai, sincerely apologizes to the co-authors and the scientific community for any inconvenience that this might cause. The paper has been cited twice. This article has been retracted on request of the corresponding author. The authors have identified errors affecting several figure panels in which original data were processed inappropriately such that the panels in Figure 3: “Cell cycle analysis of BeWo cells by flow cytometry. BeWo cells were cultured with ErPC (4 × 10 − 5 M) for 72 h, harvested, and stained with propidium iodide. Control cells were treated with vehicle alone. Cell cycle analysis was performed by flow cytometry (see “Materials and methods”). The results of a representative study are shown; two additional experiments yielded similar results” do not accurately report the original data. The other authors were not involved in making these figures. The corresponding author, Dr. Takai, sincerely apologizes to the coauthors and the scientific community for any inconvenience that this might cause. The paper has been cited once. This article has been retracted on request of the corresponding author. The author has identified errors affecting several figure panels in which the original data were processed inappropriately such that the panels in Figure 4: “Expression of the cell cycle- and apoptosis-related proteins treated with PK11195 in choriocarcinoma cells measured by Western blot analysis. Choriocarcinoma cells were treated with PK11195, and cell lysates were harvested after 48 h. Western blot analysis was performed with a series of antibodies (cyclin A, cyclin D1, Bcl-2, and cleaved caspase-3). Control cells were treated with vehicle alone. The amount of protein was normalized by comparison to levels of GAPDH” do not accurately report the original data. The other authors were not involved in making these figures. We believe that the most responsible course of action is to retract below these three papers. The corresponding author, Dr. Takai, sincerely apologizes to the co-authors and the scientific community for any inconvenience that this might cause. The three Tumor Biology papers were published in 2011 and 2012. We contacted Torgny Stigbrand, the editor in chief of Tumor Biology, who forwarded us an email exchange with Takai. The emails indicate that, true to the statements, the author did request the retractions. We also sent a note to Anticancer Research via the journal’s contact form, and to the International Journal of Gynecological Cancer Editor in Chief Uziel Beller. Takai has not responded to our request for comment. We will update this post if we hear back from anyone else. I feel that word should be reserved for those that do not accept responsibility for their actions. I myself do not understand the situation well enough to make such an assessment. The first paper’s figures 2B and 2C seem to have similar bands for p21 and E-Cadherin. If I am interpreting the results correctly, B and C are supposed to be results from different cell lines, Ishikawa and HEC-1B cells respectively. An investigation (Japanese) at Oita University annouced on Feb 27, 2015 that 21 papers should be retracted.